January thaw came a week or so late this year. That’s fine as long as it gets here with its mild days, a respite in winter that all enjoy. It’s a promise of spring. The first wildflowers are trying to bloom. Dead nettle was blooming in the garden last month. Corn speedwell had a flower or two open today. These are another promise of spring. The ice fangs and columns have fallen during January thaw. Some would like this to announce spring. I prefer February to finish out as winter and see the season to a close on time. I went walking as the day was too nice to spend working. But I did have a chore I had forgotten to do. For years a yellow honeysuckle has grown over the rocks above the creek. It’s the only one I’ve ever found here until last year. A yellow honeysuckle grew, bloomed and set seed along the road last summer. I collected four seeds to set out on the hill over the creek near where the one lonely plant grows. This lovely day those seeds finally got out and planted. I don’t know if any will grow, but one promise of spring is that seeds will grow. Many people don’t like these ancient animals. I find them interesting. 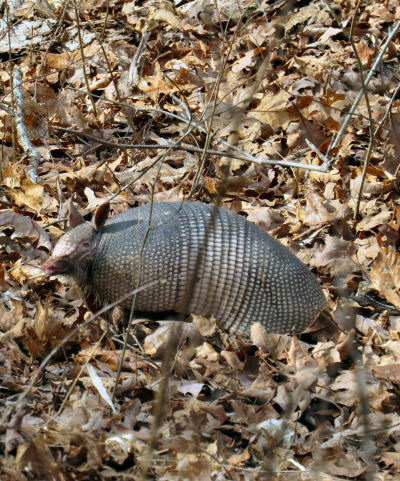 Armadillos are now regular Ozark residents and often bulldoze through the dry leaves on winter days as they do not hibernate and must find food every day. 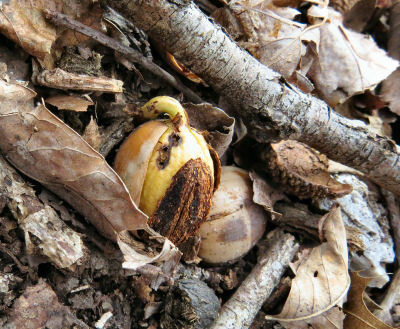 The acorns have been getting a head start on spring. Last fall was an acorn bonanza. There are still many on the ground and some have sprouted. Most of the small sprouts dry up and die. I hate to see this, but it is part of how things work. The woods can’t hold that many oak trees. Even among those acorns that do survive, many young trees will die in a few years as the larger trees block the sun and absorb the water. The acorns are sprouting. Most will perish. A few will become saplings. Fewer will grow to trees. A couple will become large trees. Each acorn is a bundle of hope and a bundle of food for squirrels, turkeys, deer and more. One of the problems my fictional Carduans must solve is that of food. Looking at all the acorns on the ground, I began wondering about eating them. Right after lunch this thought wasn’t very serious, mostly curiosity. So I found one still intact and dug out some of the interior nut. Very bitter. Of course the Indians washed the flour with hot water to leach the tannic acid out and make the flour palatable. And they weren’t spoiled with sweetners. Perhaps I will give acorns another chance this fall and wash the acid out. Fresh nuts washed free of acid might make a big difference. 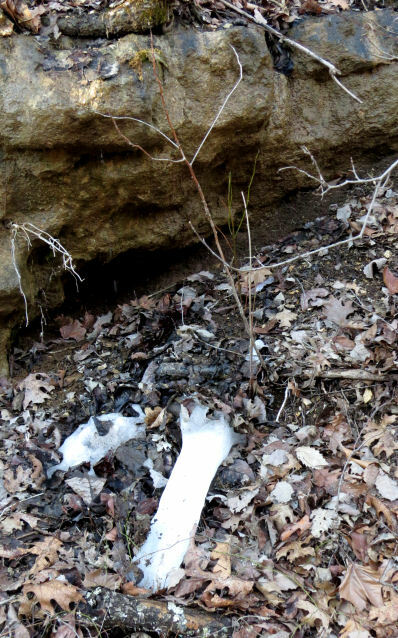 This entry was posted in Ozark Hills and tagged armadillos, Ozark winters, trees on February 6, 2019 by [email protected]. Lately numerous little holes have been appearing around the house and barn. An armadillo has been spotted nosing along in the yard. Another has been working through the goat yard. I know. I know! Armadillos are resented here in the Ozarks. They can be terrible pests because of the holes they dig. In spite of big ears, armadillos hear poorly. They do stand up on sturdy legs and can run very fast. Their bodies are covered with stiff, pebbly armor. The nine bands act as joints so the armadillo can bend. The ringed armor on the tail lets the tail bend. I’ve heard people brag how their dogs kill armadillos. I’ve seen the carcasses along and on the road. I’ve also heard people complaining about Japanese beetles. These insects destroy roses, okra, grapes and other plants. This has been a bumper year for them. 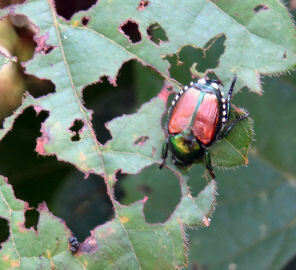 Japanese beetles eat out the leaf tissue between the veins. They are voracious and can soon leave a plant with only the skeletons of their leaves. Japanese beetles lay eggs in the ground. These hatch into grubs that live and grow in the soil over the winter. When warm weather arrives, the grubs molt into beetles to fly off and devastate plants. An armadillo is interesting to watch. It’s possible to get very close to one as they have very poor eyesight. Their hearing isn’t a lot better. Their noses rival a dog’s. The armadillo is covered with front and rear pebbly armors. Ozark ones are nine-banded so they have nine narrow plates forming strips between the front and rear allowing the armadillo to bend. A triangular plate lies down the face. The tail is a series of circular plates. Hair sticks out under the armor. The armadillo is suspicious but hasn’t spotted me yet. It stands up to smell the air hoping to catch my scent. You need to stay downwind to sneak up on an armadillo. Notice those big claws on the front feet. The front feet have long claws. These make them digging machines. The mouth has stubs of teeth for grinding up insects like grubs. Young Japanese beetles are grubs. The armadillo shuffles along. It’s nose sniffs the ground. It can smell a grub several inches down in the ground. A few digs with the claws reveals the grub. Dinner. Smelling some insect down in the ground, the armadillo tears out some grass and dirt to push its nose in further until the prey is exposed and consumed. Armadillos don’t hibernate. It takes a lot of grubs to keep them from starving or freezing over the winter. Over the summer armadillos hunt at night. That armor gets hot in the summer sun. When the weather cools down, armadillos come out during the day. The holes have been around all summer. Now I get to watch the armadillos at work. The one around the house was so intent on hunting, it walked up within a foot of my feet. It realized I was there, turned aside and went another direction a bit faster than on the approach. I startles this armadillo. It first backed into the goat-trimmed giant ragweed and hid. When I came another step, it bolted out into a bigger stand of ragweed and disappeared except for the rustling of ragweed plants. An armadillo is not aggressive. It does not bite, sting or attack unless grabbed. It’s main defense is running away at amazing speed. The claws are formidable weapons used in self defense. The little holes are annoying as the lawn mower bounces along over the yard. Even without the armadillos the mower would bounce along because of the moles. Between the two pests, perhaps the Japanese beetle population will be less next year. This entry was posted in High Reaches and tagged armadillos, Japanese beetles, Ozarks on September 13, 2017 by [email protected].